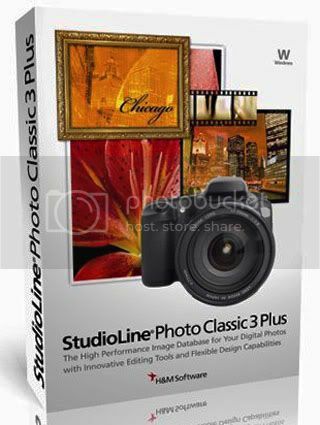 tudioLine Photo Classic 3 Plus is an equally powerful and easy to use software for the convenient management and editing of extensive image collections for any digital photography user. StudioLine Photo Classic 3 Plus manages images of all common graphics formats in a secure "Image Archive" database. Categorize your images with textual descriptions of any length in system descriptors or your own user descriptors, or assign keywords and ratings. After that, locating individual images or finding images to match a certain theme will be a trivial task.tudioLine Photo Classic 3 Plus is an equally powerful and easy to use software for the convenient management and editing of extensive image collections for any digital photography user. StudioLine Photo Classic 3 Plus manages images of all common graphics formats in a secure "Image Archive" database. Categorize your images with textual descriptions of any length in system descriptors or your own user descriptors, or assign keywords and ratings. After that, locating individual images or finding images to match a certain theme will be a trivial task.